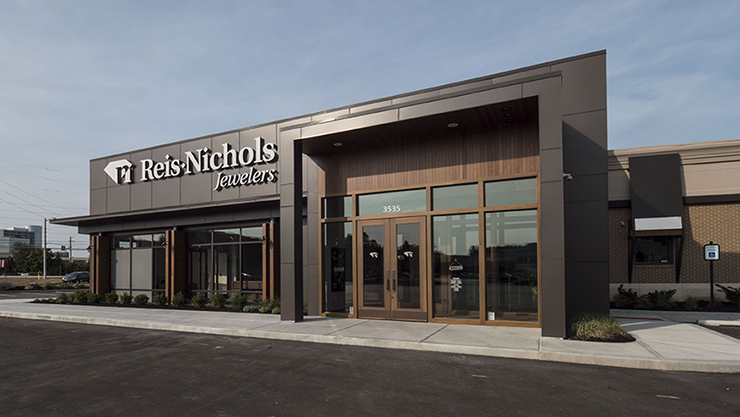 Reis Nichols Jewelers, located in Indianapolis, is a high end jewelry retailer with an in-house custom jewelry fabrication and watch repair shop. Materials & Methods was engaged by Reis Nichols to re-design the entire interior of their store in a more thoughtful and contemporary way. For this project, Materials & Methods approach was to focus on the early stages of the design process, by first establishing a thorough understanding of the company and its operations. Through onsite observation and employee shadowing we were able to discover unexpected opportunities for improvement and “out-of-the-box” solutions for resolving many of the current technical, operational, and spatial challenges. Once we had established the functional requirements, we were then able to focus on defining the aesthetic and architectural drivers, by applying the findings from our initial creative workshops. We started this process of discovery with a “Creative Workshop” in which we established the basic design criteria. The early phases of the design process culminated with a focused “Project Brief” that clearly establishes the project's goals and objectives as defined by the Reis Nichols team, paired with in-depth analysis of the existing facility and operational considerations. The next step was to further define the project goals and requirements with the Design Brief - compilation of documents, diagrams, images, and videos that outline the project goals and objectives with all necessary research and documentation- and a Research and Operational Review phase. The purpose of this Research and Review phase was to analyze the existing operational structure and facility and determine the defining strengths and system weaknesses while the Design Brief becomes the foundation of information from which all other design decisions are based. Finally, at the end of all the analysis and research phases there is an established an “Architectural Program”.This document is a list of areas, functions and enclosed spaces required in the final construction with the associated square footage allotment, and particular requirements for each area. These considered areas created the outline for the final floorplan, with all other elements slowly configured in based on the client's needs and aesthetic goals of the shop. The end result of this process was a highly considered floorpan that provided optimal functionality, and a specially considered customer flow, for all the related areas and departments. The Reis Nichols store is still in the design process and will begin construction in the Spring of 2017.